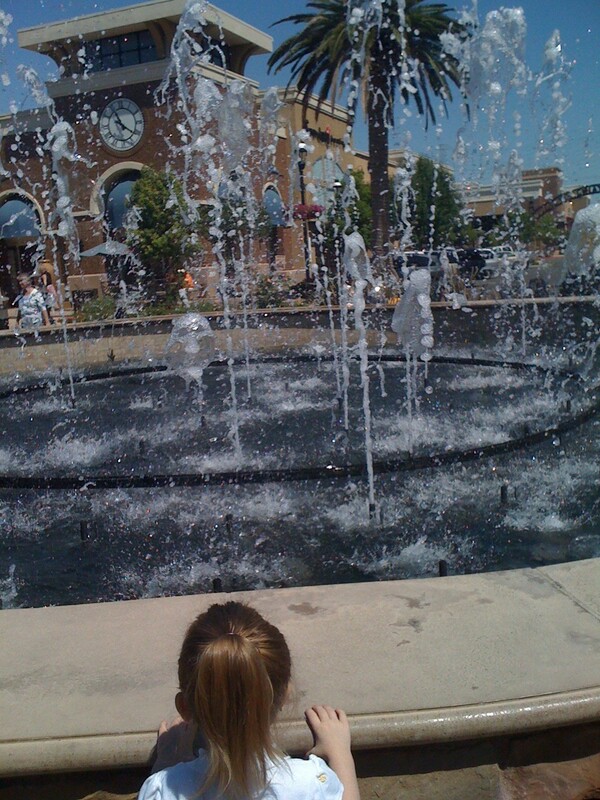 This morning we were running errands when Katie spotted a huge fountain and wanted desperately to get closer. We didn’t have a ton of time to finish our shopping before we had to hurry home for lunch and naps, but she asked so nicely that I indulged her. We sat and watched the fountain for 15 minutes and she laughed with glee every time the water shot up. There was no errand more important that seeing how happy that little bit of time in front of a fountain–a fountain that I’ve looked right past more times than I can count–made her . Lunch was delayed, naps were late, but we were happy. And that truly is all that matters. Definitely a cherished small moment, cute! AW! I still giggle like that at fountains. Whoa – that photo blows my mind with awesomeness! Definitely a good Mommy moment. There are days when it seems like all I say is "no." It felt so good to just say "yes" and watch her shine with delight. That is honestly the coolest fountain…it seemed like the water never shot up in the same way twice. She looks so tiny next to it, doesn't she? She kept saying "thank you, Mommy" after. It doesn't take much to please them when they're little. hands-down my favorite thing about having a 3 yr old is how easily she is entertained. it's so fun to watch them light up over something as simple as a fountain (my daughter loves them too … her favorites are the ones she gets to throw coins into!). How beautiful! I am going to slow down tomorrow! Thank you! I was so close to hurrying her along and sticking to my schedule. I'm so happy that I didn't. Enjoy your tomorrow…I'd love to hear about it. Such a happy moment. Why can't they stay little for ever? Such a sweet, perfect story and picture. Thank you! I'm sure that you can imagine just how delighted she was. That girl just loves to stop and smell the roses. Nichole, Max just saw this photo and told me, "I'm going to go swim there when I grow up!" He keeps asking to watch Katie's pancake video! So cute!